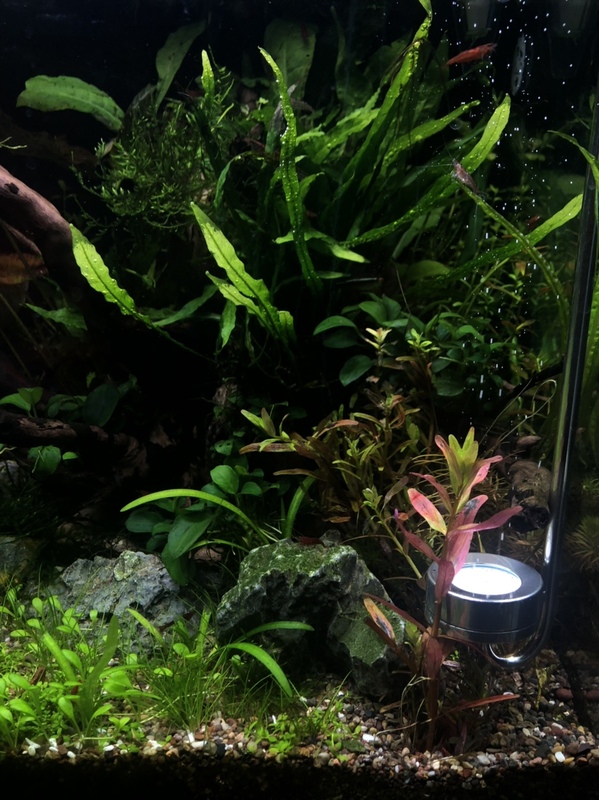 I’ve had this 17 gallon Mr. Aqua rimless tank. I don’t really know the dimensions as of right now, but when I find out, I’ll make sure to update the thread. 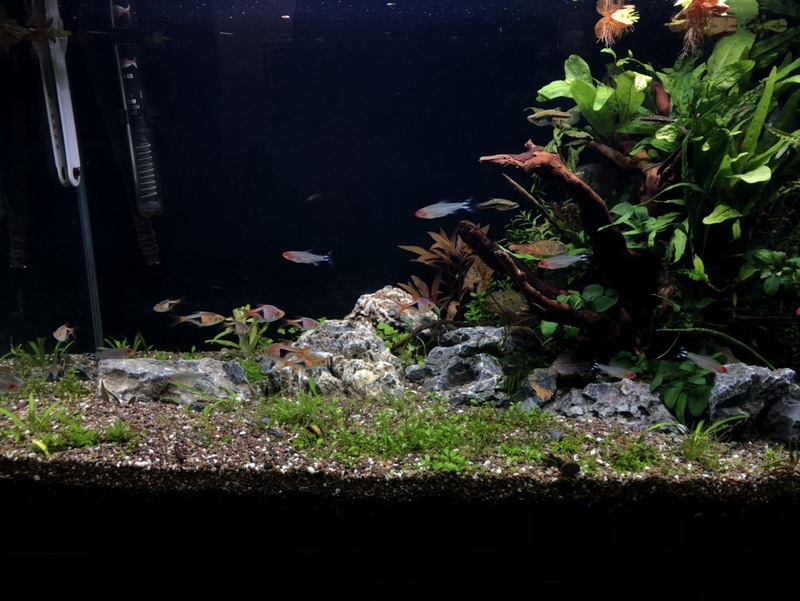 Some of you have seen this tank but with a layout that was someone bland and boring. I tried to find something that I liked about it but never got it. 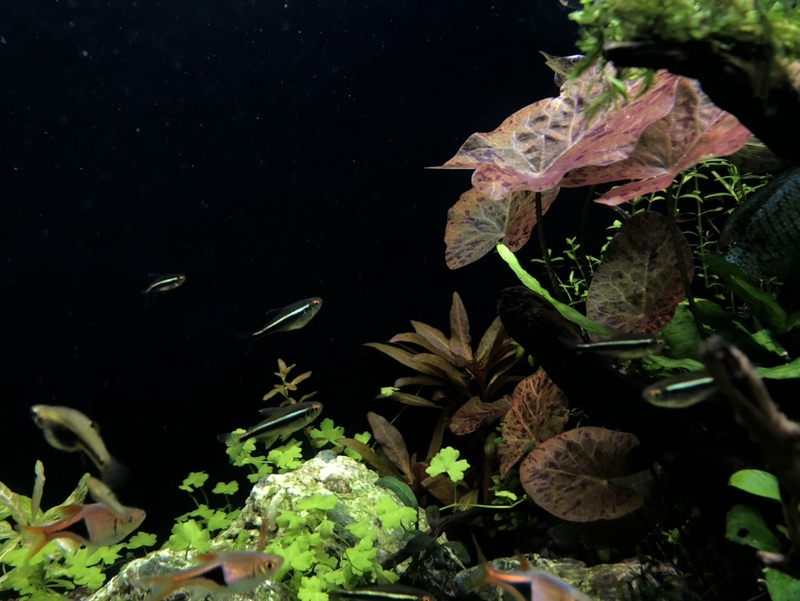 I saw a video of George farmer scaping a Nature Style Aquascape and I got so inspired that I knew what I wanted to do. 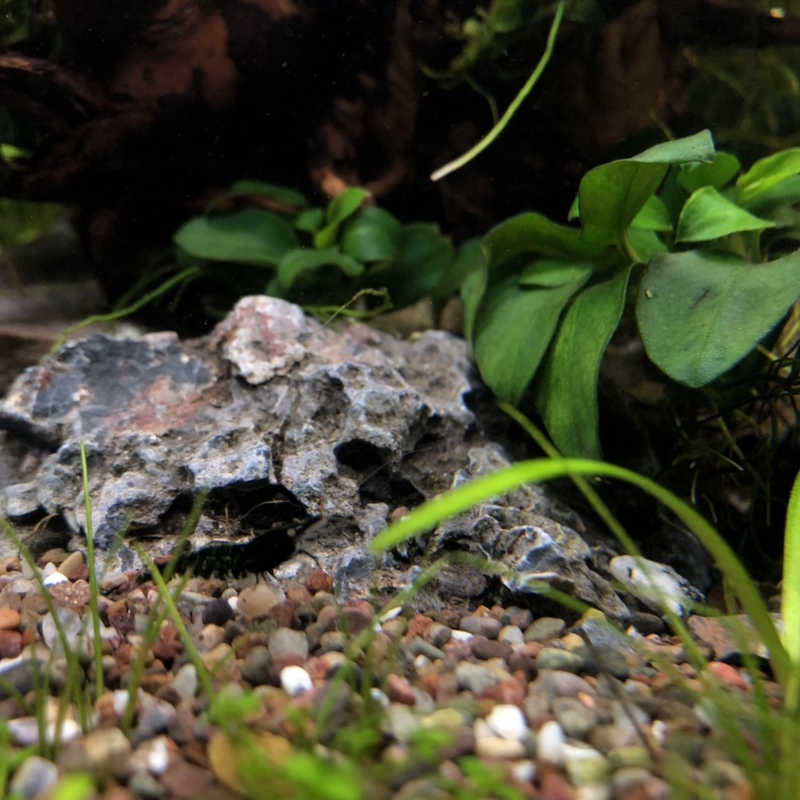 I used seiryu stone and one big piece of spider wood. I tried boiling this bad boy but it didn’t really fit... 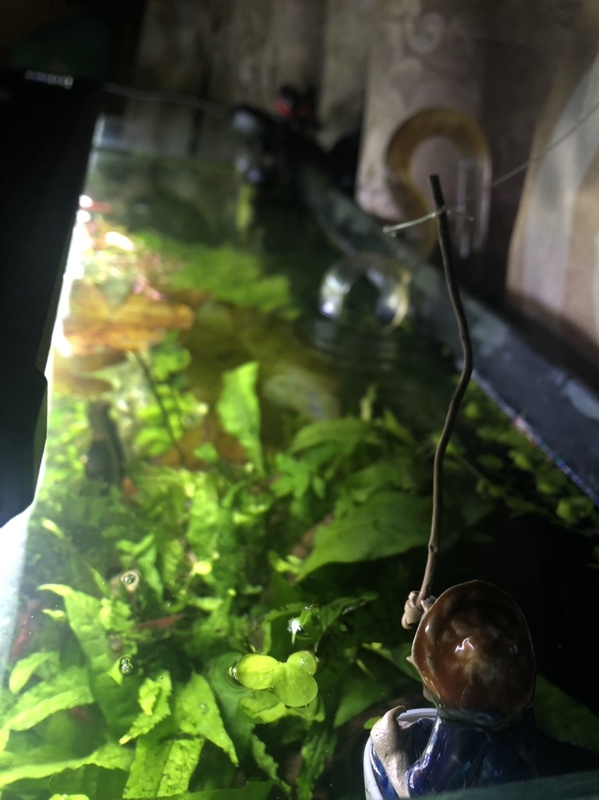 I soaked it and tried to water log it in boiling water & super hot water but it still floated. 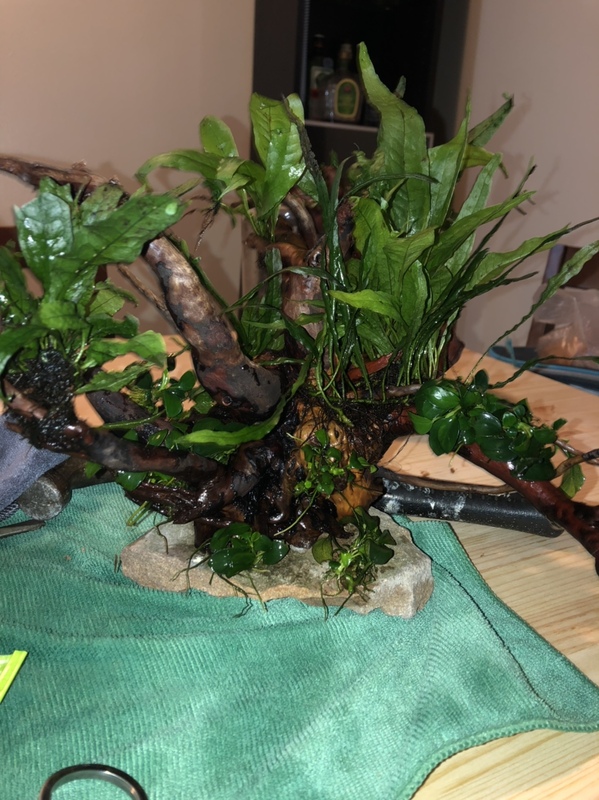 I got really anxious to put the wood in, so I glued it to a rock (luckily the wood already had a base) I covered it with anubias nana and java fern. 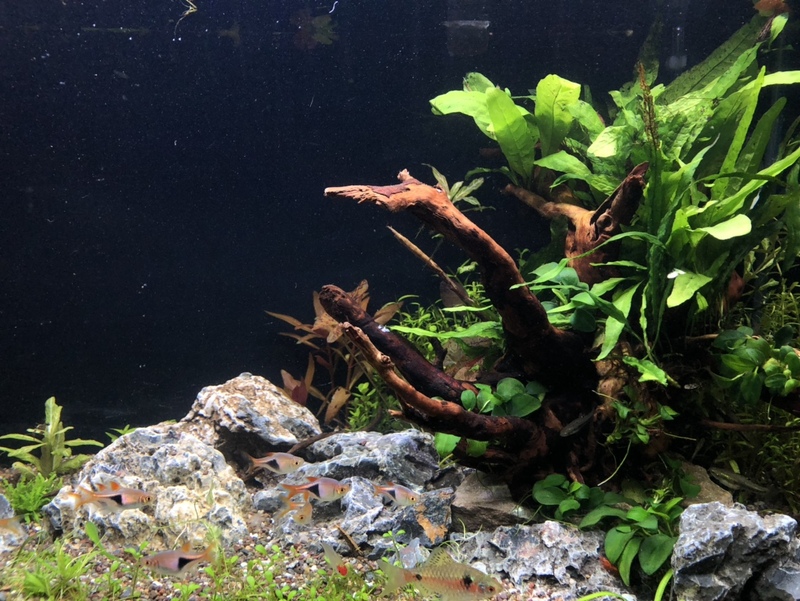 Foreground plants are glosso, hair grass, and Monte Carlo, and maybe some crypt prava. 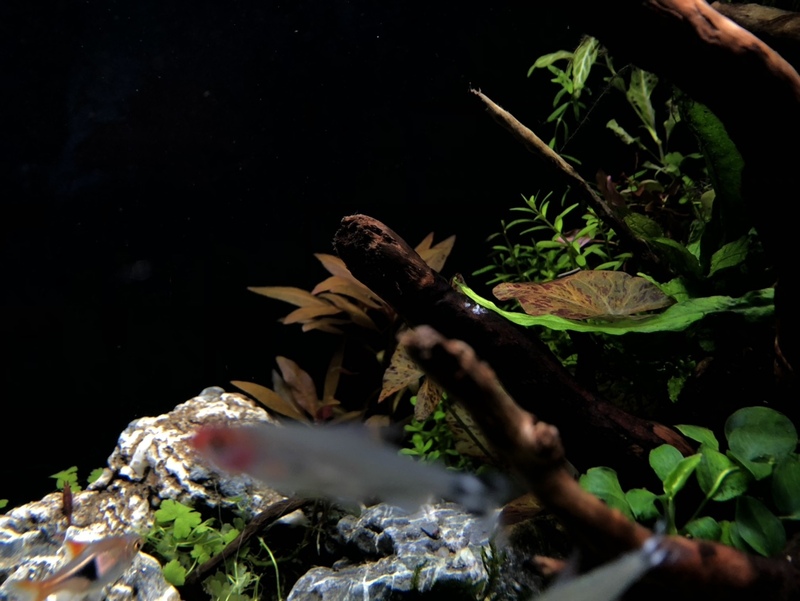 Behind the wood and tree is a mixture of rotala that I did a heavy planting because of my gouramis. 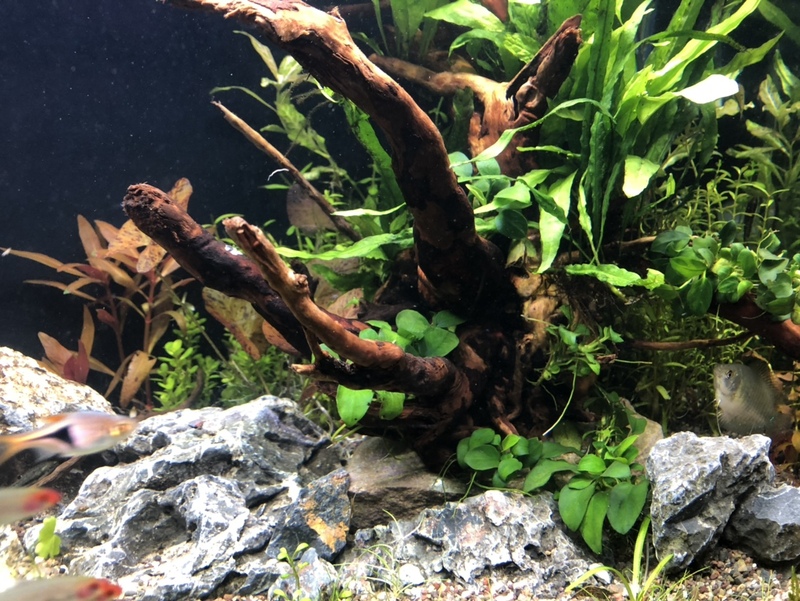 My plan is to plant the other side of the rocks with the same foreground plants. I can try and link the video that I used as inspiration. 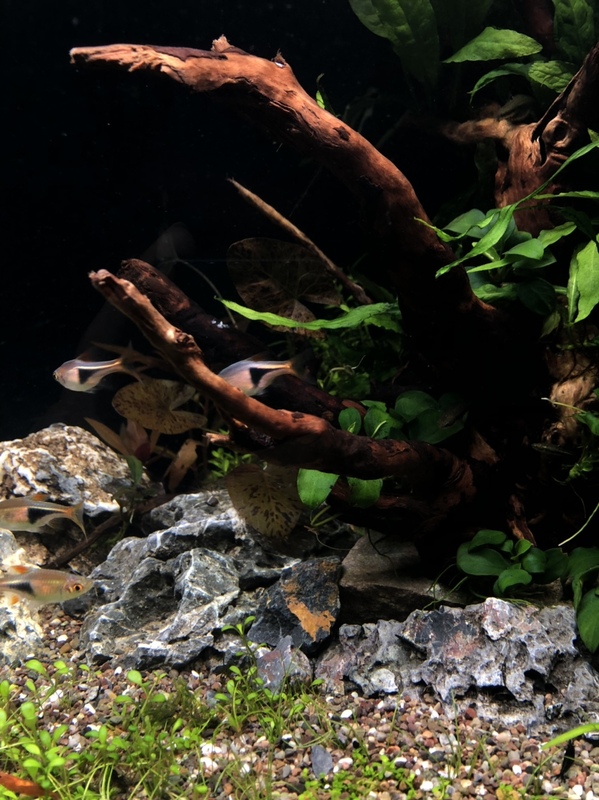 Here are the finished scape pics. Here are some better pictures I took, taken with iPhone 8 they look a lot better once I realized how to play w the settings. You've done a beautiful job with it. 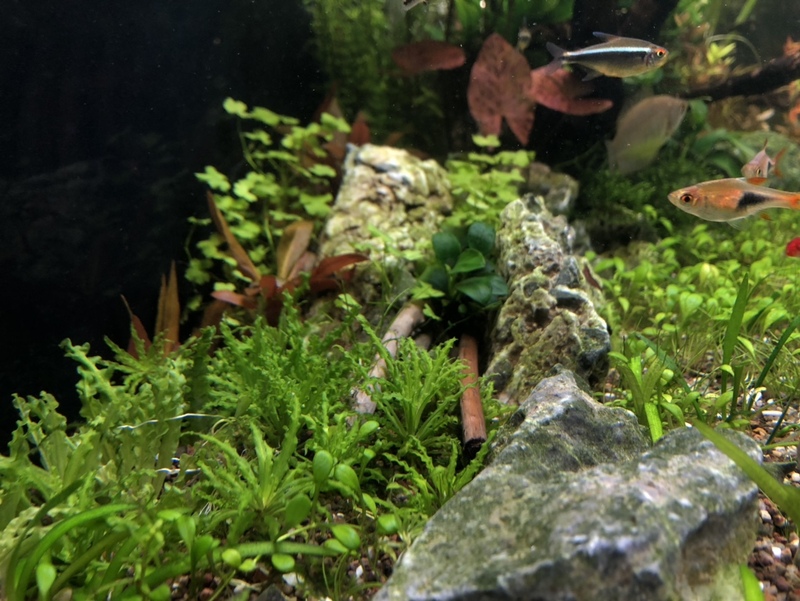 Out of the whole tank, I think the a.r mini really stands out a lot. 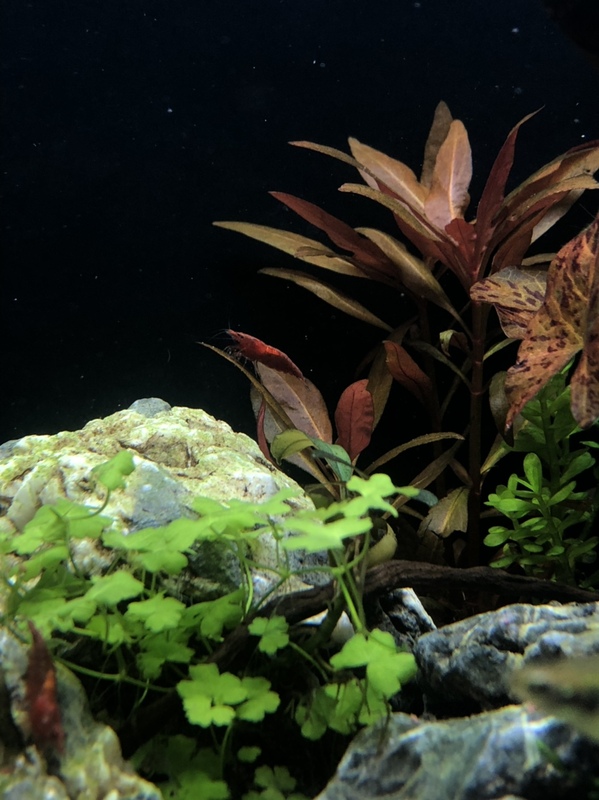 I’m trying to get more “red” plants to bring out the contrast with the black background and green lush plants in the front. So far I have that and the red tiger lotus! Haven’t updated this thread in a while. But here goes nothing! 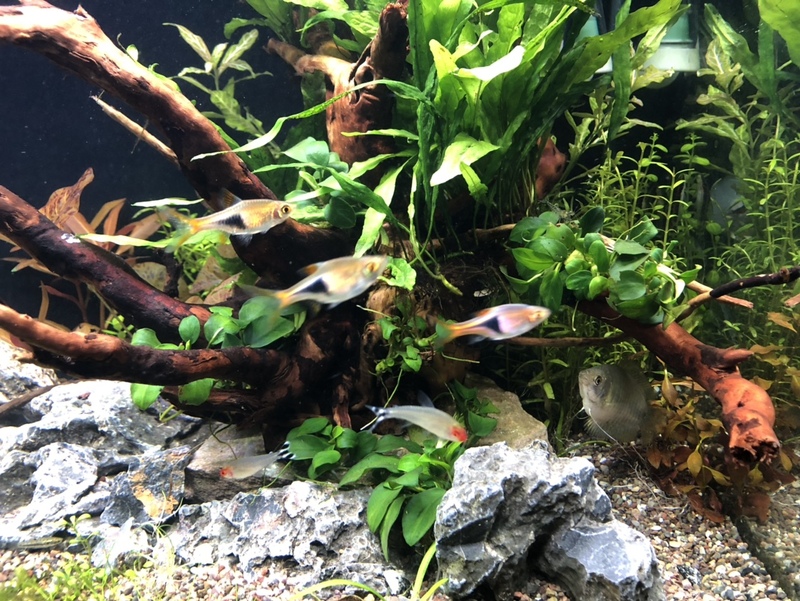 I lost one of my rummy nose tetras recently, why? 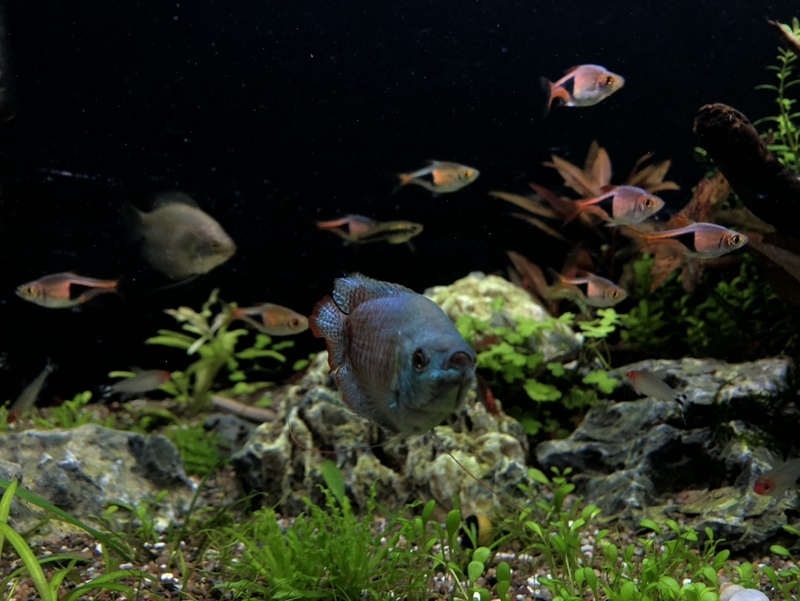 I don’t know, but every fish looks healthy and no signs of disease. 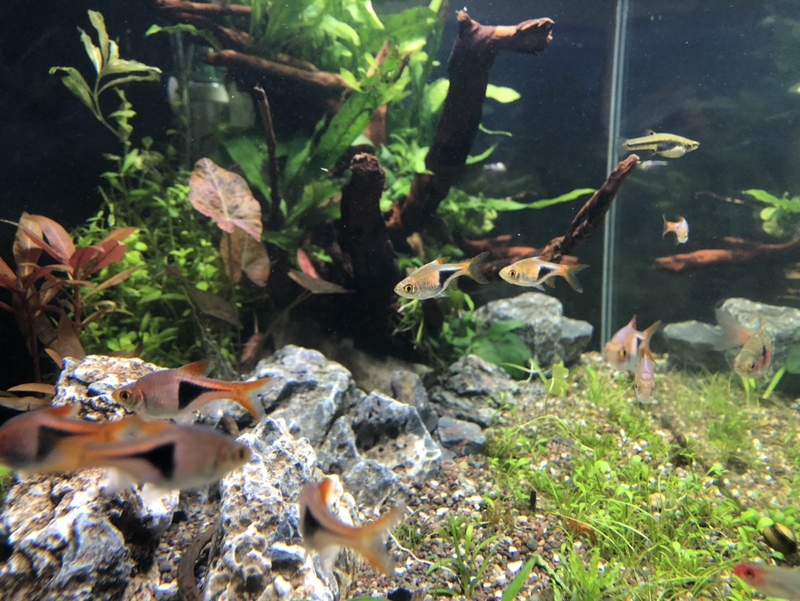 I want to add more Harlequin rasboras and more rummy nose tetras, but I’ve been thinking of getting a small nano schooling fish just because. 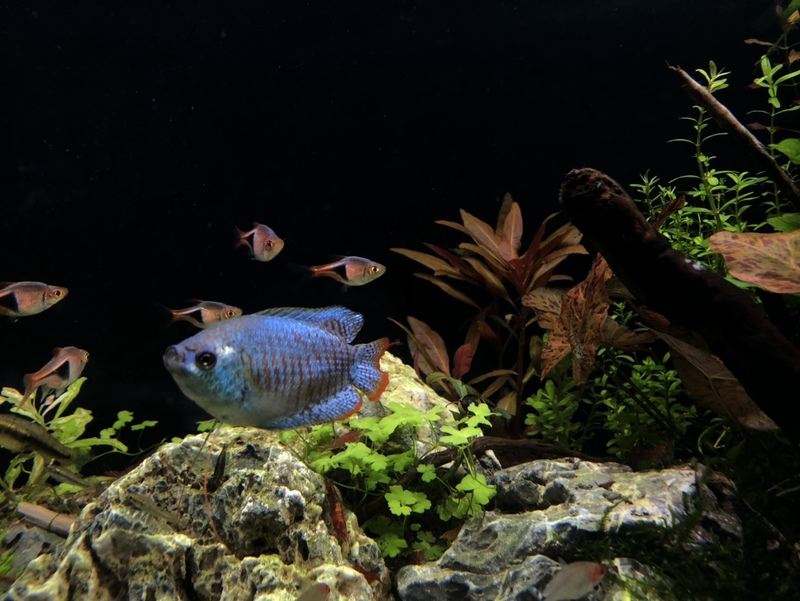 I’ve noticed that my male blue dwarf gourami hides A LOT and idk if it’s because it’s shy, or needs more fish for it to feel comfortable, after all, he is the big dog of the tank. 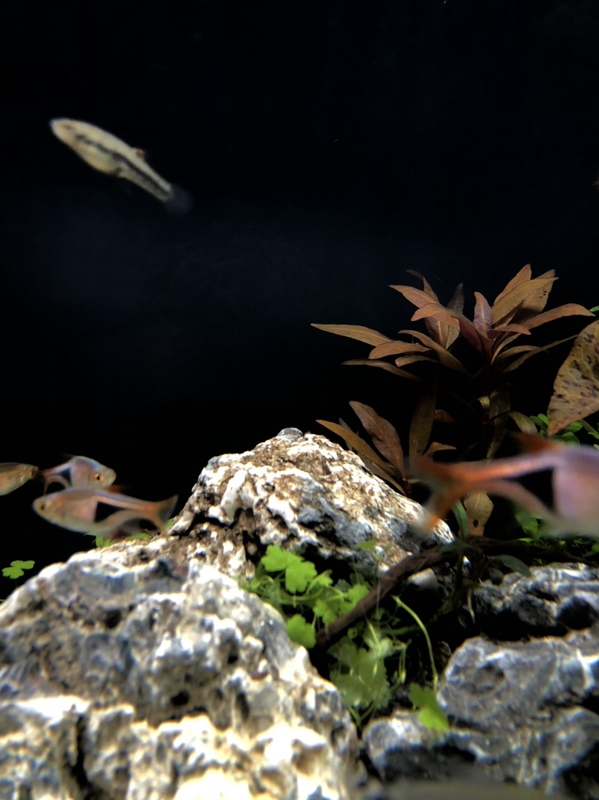 Recently I’ve been seeing my glosso grow rapidly fast! Sending shooters everywhere. 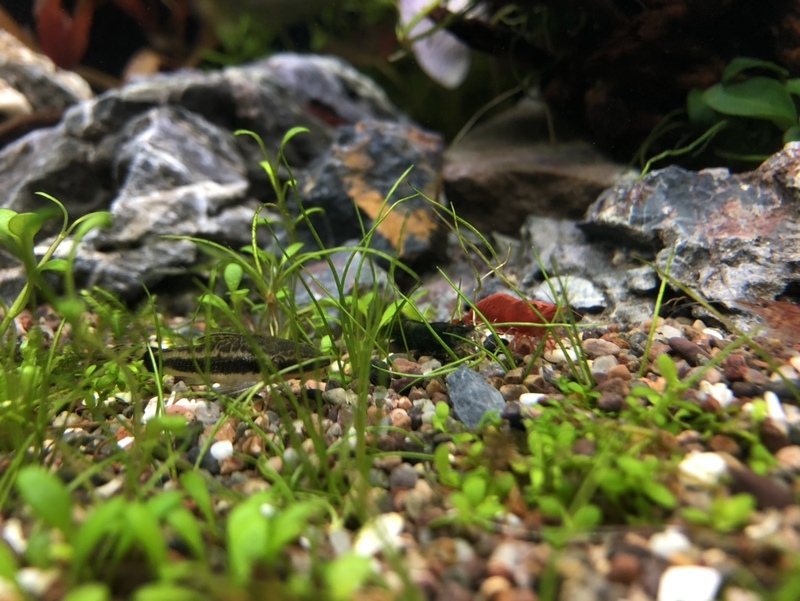 It’s a mix “carpet” I have hair grass, Monte Carlo, and (pogostemon?) the Monte Carlo is slow and so is the hair grass. 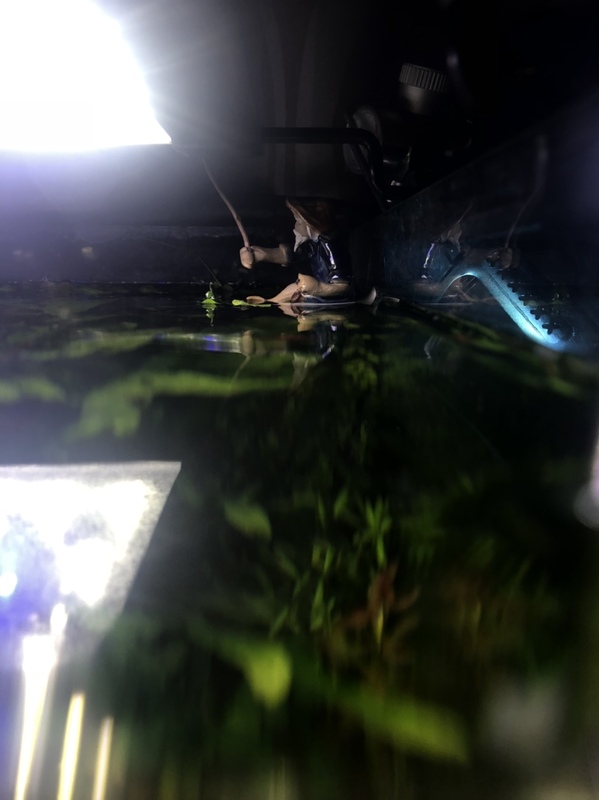 To finish this little update, my plan is to get the whole thing carpeted, and maybe even upgrade tank (it has scratches) but I don’t really mind the scratches at this point because when I look at it from a far all I see is beauty. Here’s some close up pics. Enjoy and please leave me any feedback or advice! 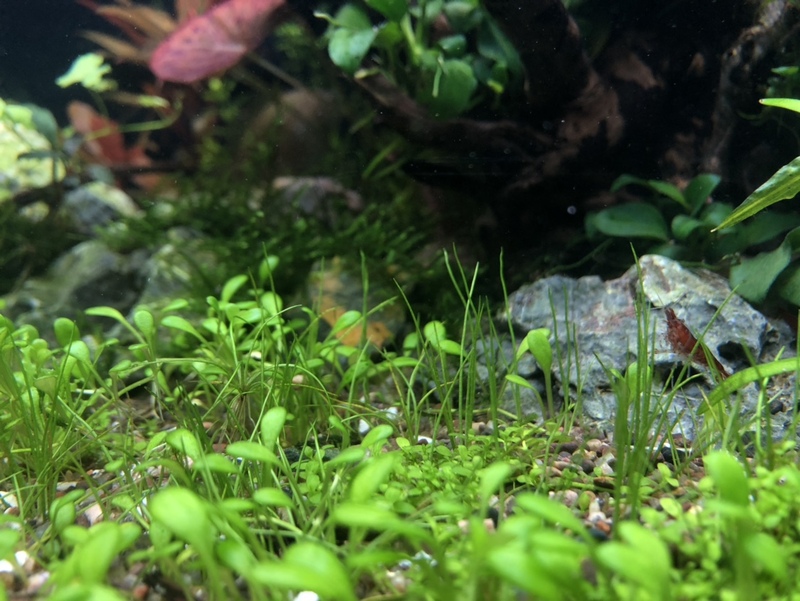 What's the spoon-shaped-leaf carpet plant in your last picture? 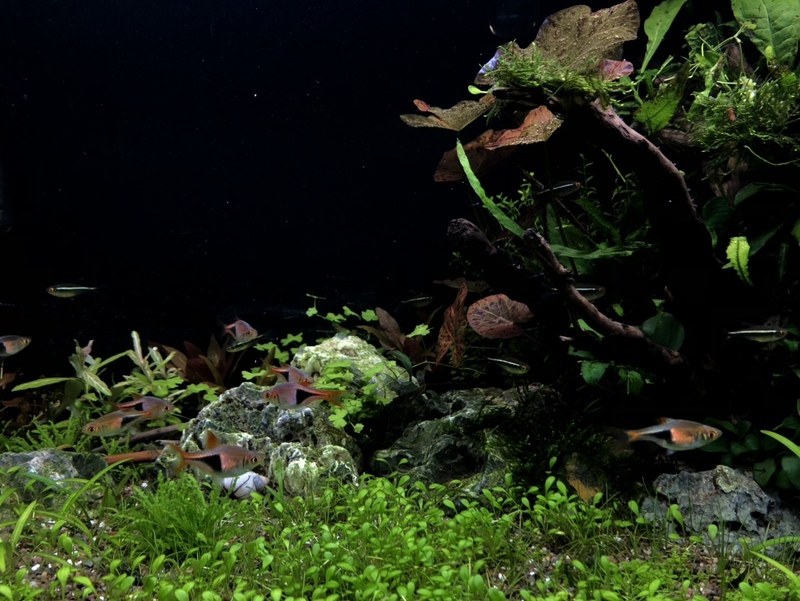 Great scape! 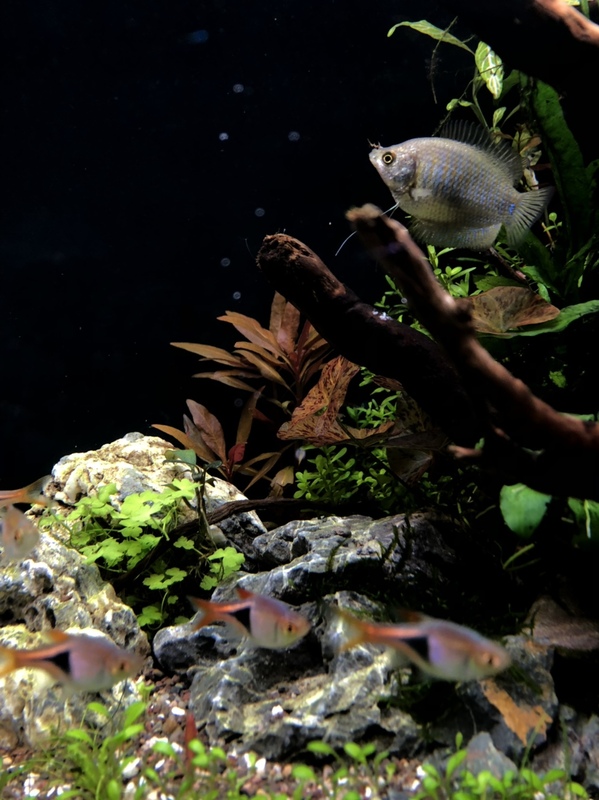 Pictures due your scape justice. 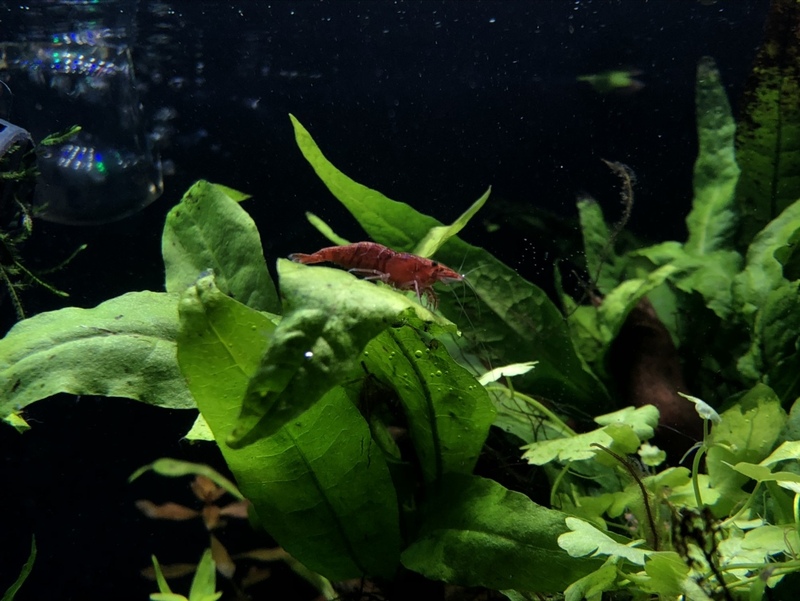 Loving the black shrimp. Thanks dude! 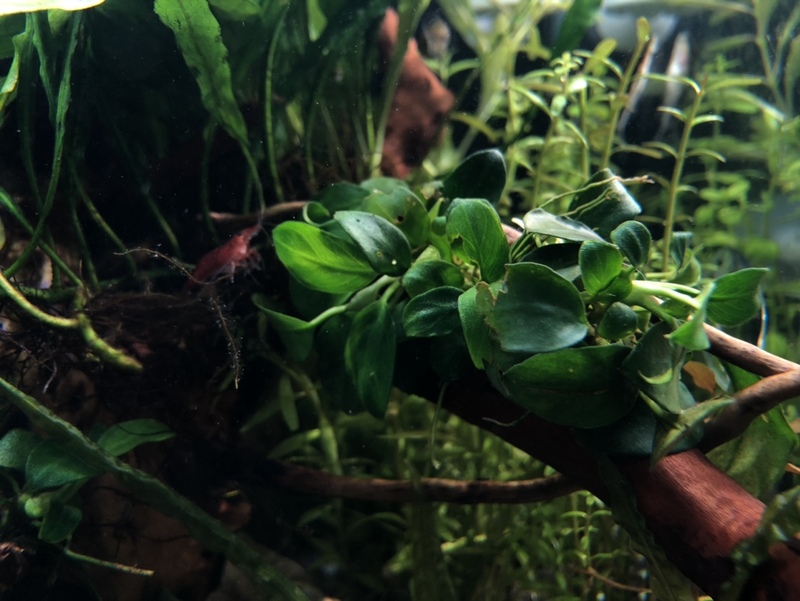 I have all kinds of shrimp in here, most are wild and so when they become berried, their offspring come out in all sorts of different colors like that one! 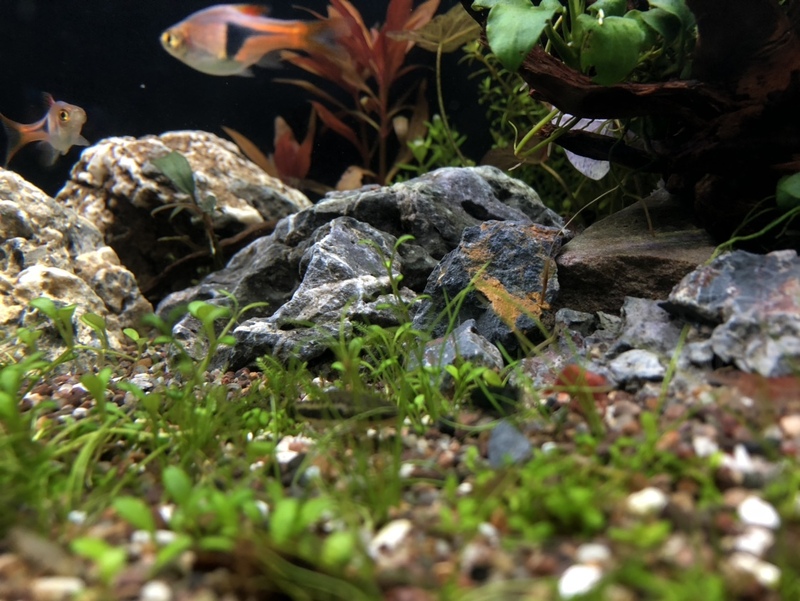 The aquascape has been doing great, somewhat of a algae problem due to co2. 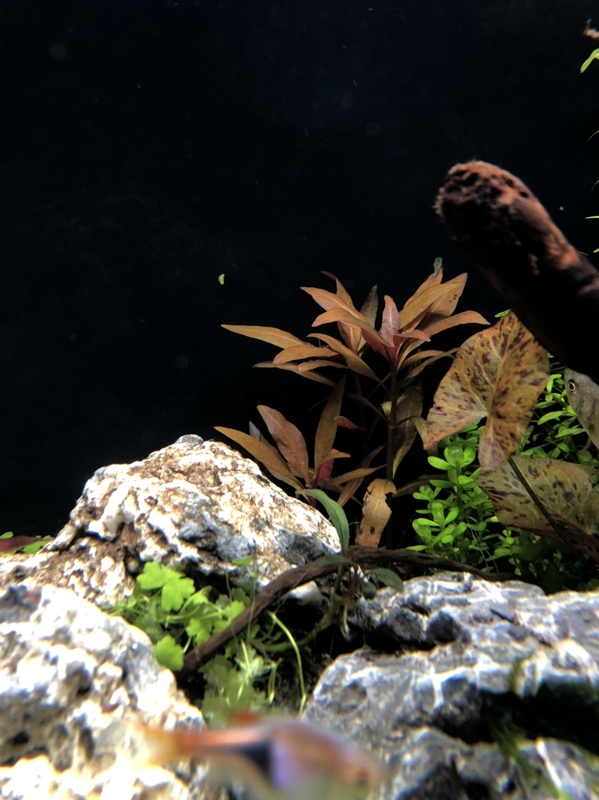 I have a co2 indicator but it always stayed on blue, then I raised the bps but then I noticed some bba, so I lowered it. Now I’m at like 1-2bps. 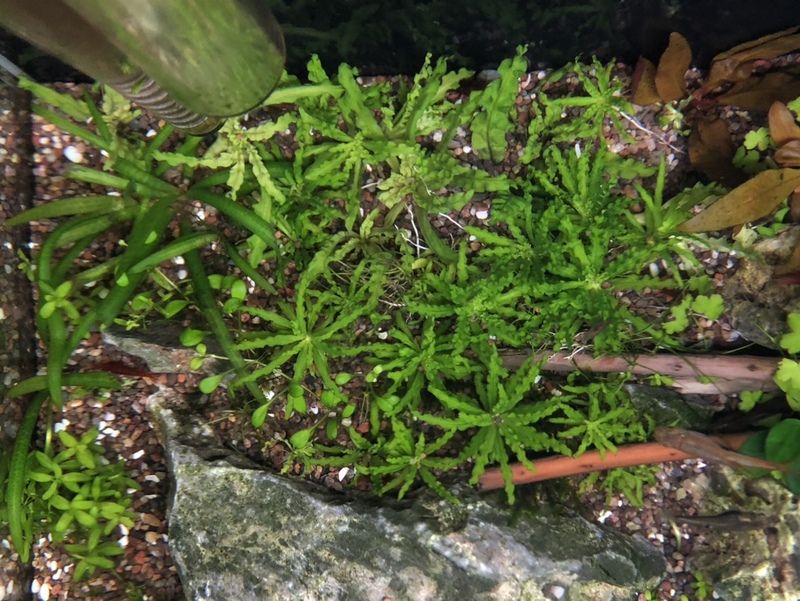 Other than that, the glosso is still going strong, I have to trim some dead java fern in order to get some more leaves. 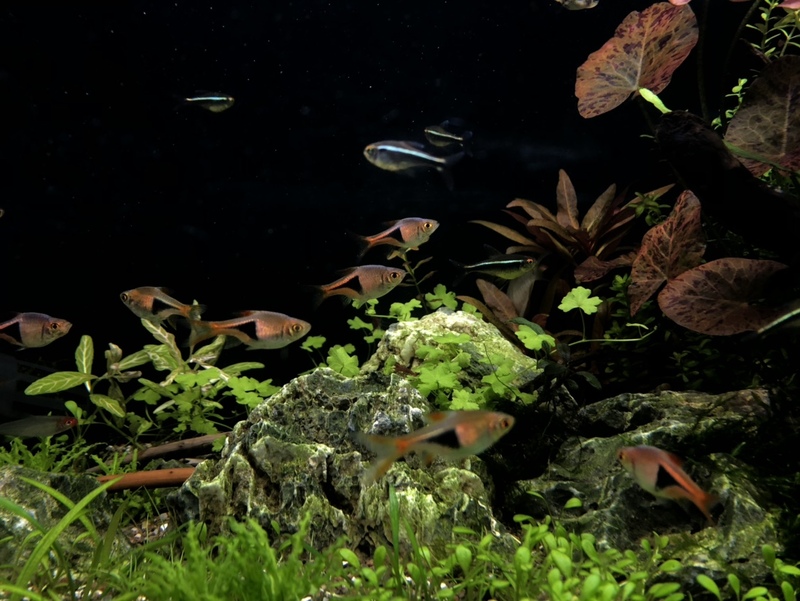 I added some black neon tetras I got from lotus aquarium. 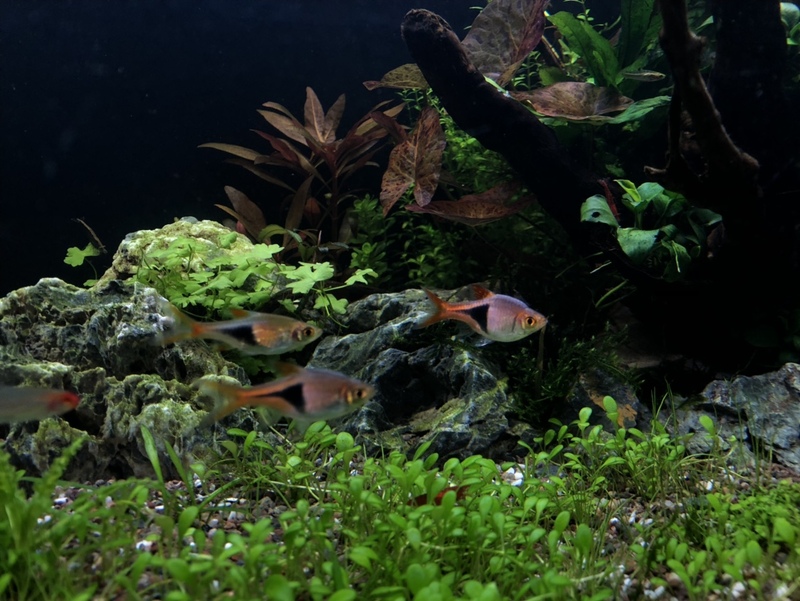 They have such a nice color especially when I’m taking pictures all I see is their neon stripe. 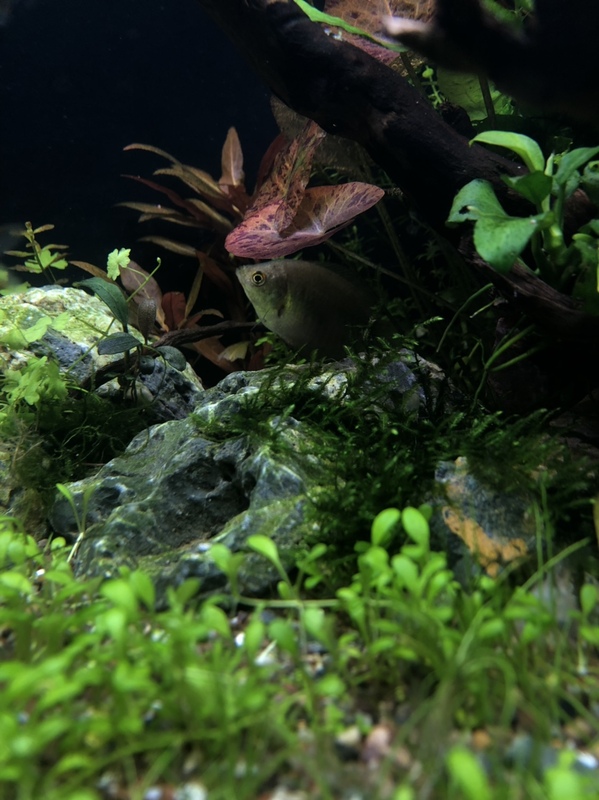 They’re becoming one of my favorite fish. 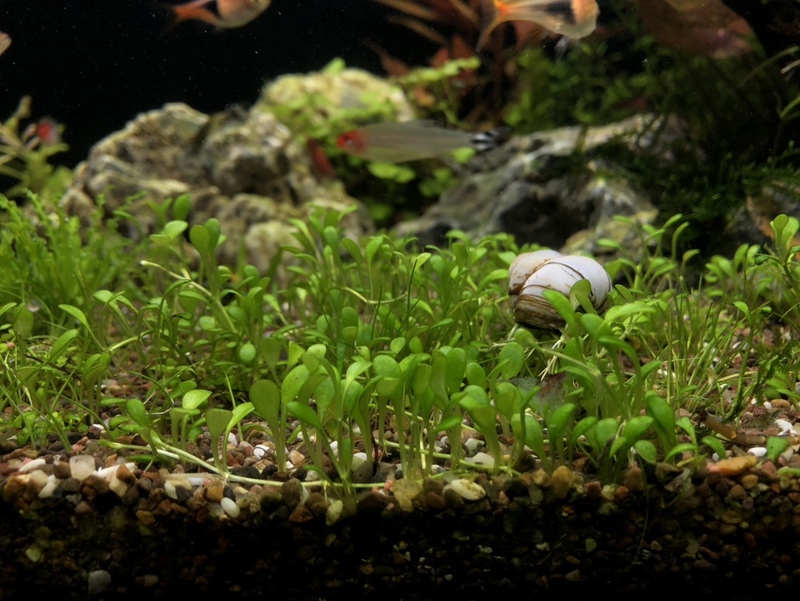 Not too long ago I was watching green aqua maintenance videos and I got inspired to “spice” up my scape. 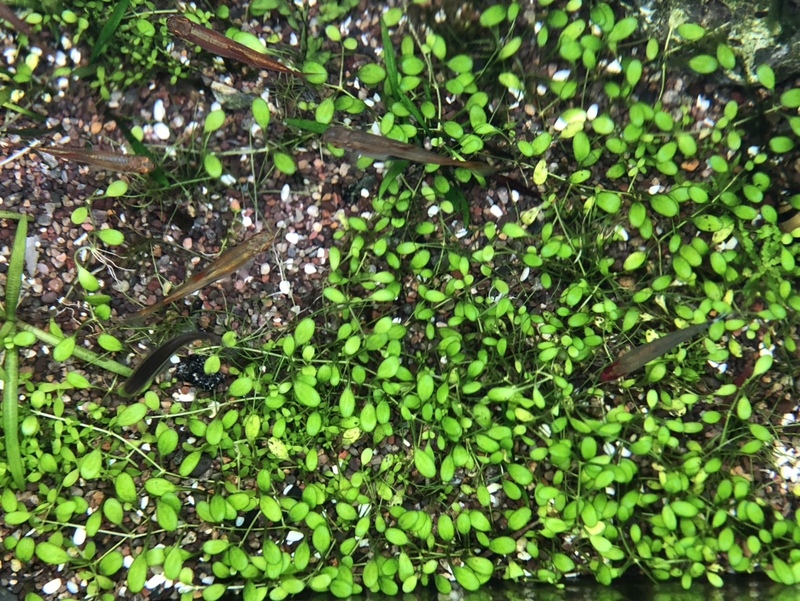 Something I did was separate the pogostemon and the glossostigma. 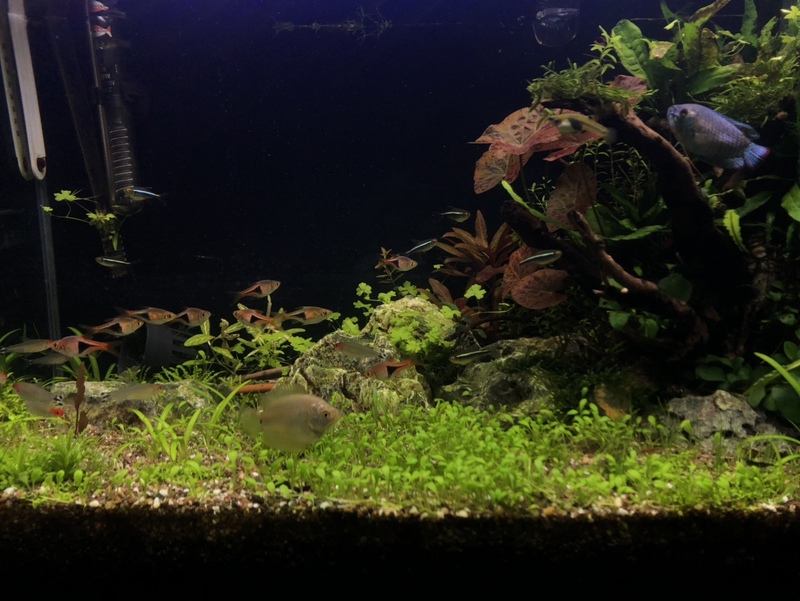 I also trimmed back a lot of the plants. 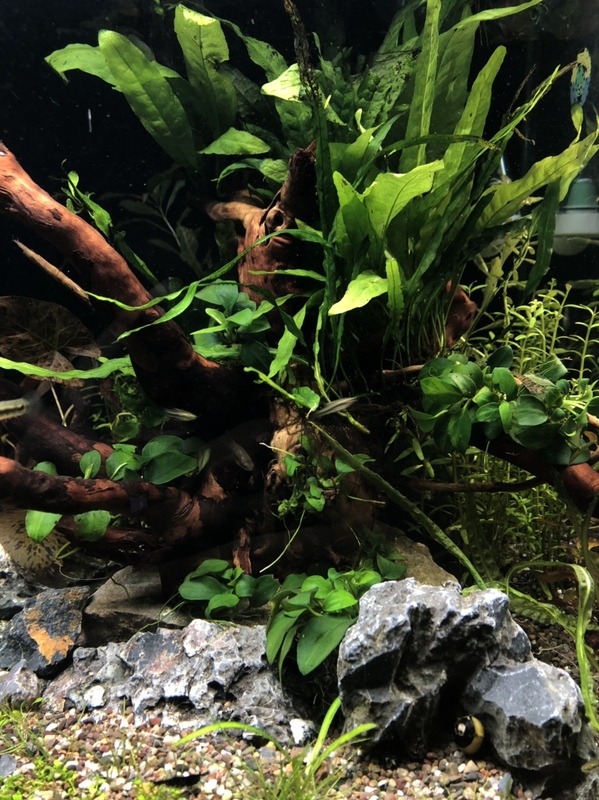 What I trimmed were the dead java fern leaves and I even trimmed some of the stem plants that are in the background. Not to mention cut back on the glosso since it was growing out of control. My goal for the new year is to learn how to control my co2 levels because I’ve been seen some bba but it’s nothing too serious. I want to add new stainless steel inflow and outflows, including a new filter. I’m looking for something that’s easier to prime and clean because to he honest, the eheim 2213 is a p.i.t.a when it comes to priming and I HATE it. 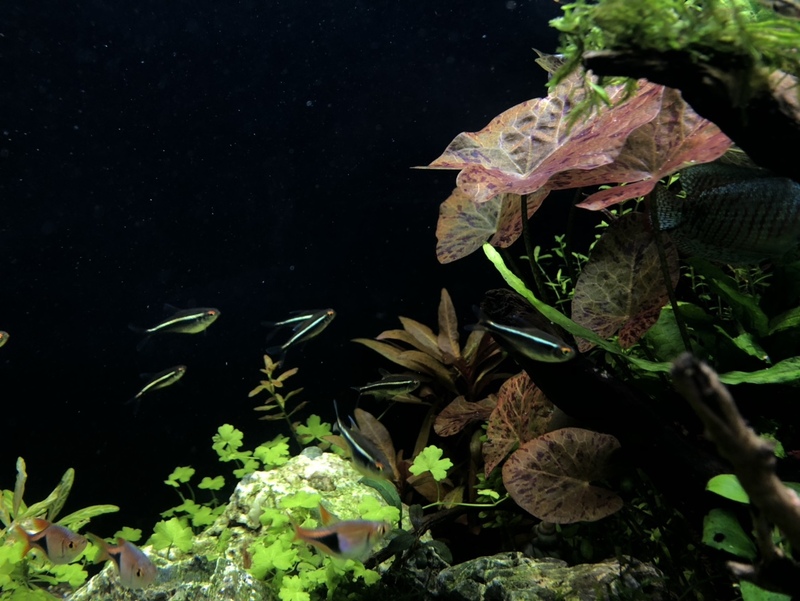 I also want to buy myself a nice light, maybe a fluval aquasky but I’m liking this amazon nicrew light. 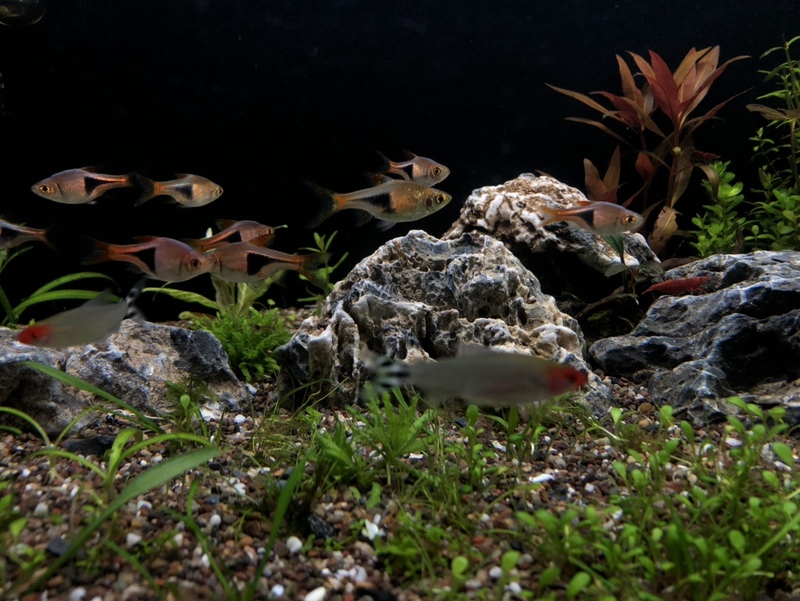 I also want my least Killifish to breed more in order to start their own aquascape (maybe) hope you guys enjoy this thread.